There's no greater constant than change. That has been generally true of life and of oysters. Throughout the years, I've come across the Cape May Salt oyster from the southern tip of New Jersey many, many, many, many times. While some of its attributes never really change (like how pleasantly plump the meats are), the salinity and sweetness have always kept me guessing. In 2009-ish, I had set out on a personal quest to capture and catalog the world of oyster flavors. It started as a basic 1-5 rating scale of salinity, sweetness, complexity, plus a healthy dose of fanciful froufrou descriptors. I even recorded the place and time of the tasting, but that was the extent the "scientificness." For me, it was about doing fun and tasty scavenger hunt—an epicurean equivalent to Pokémon Go (is that still a thing??). 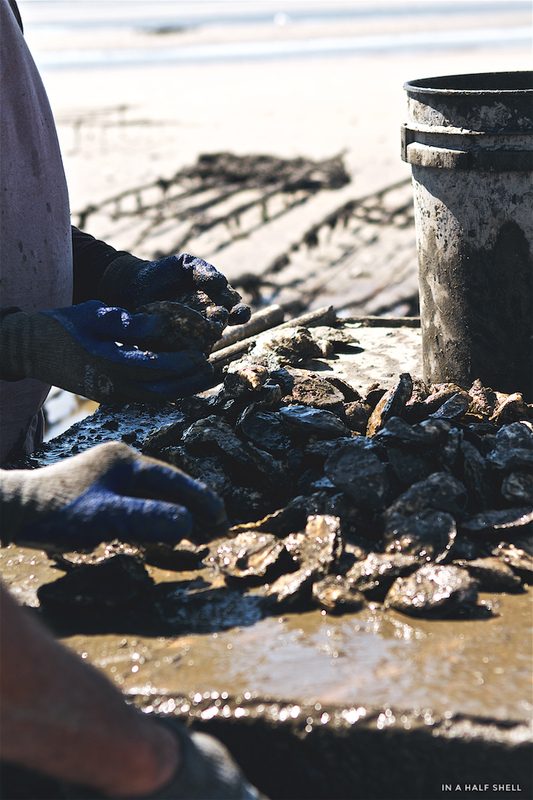 Today, the world has become inundated with books, websites, apps, and articles that insist on cataloging different oyster varietals to specific flavor descriptions. I'm guilty of this practice via my Oyster Concierge (soon to completely change), but I've come to realize that this an over-simplified and limited approach. I should've seen the obvious truth. Just sneak a peek at a fellow raw bar patron who just enjoyed their first oyster out of the dozen. They're probably grinning from ear to ear. It's not because their taste buds agreed with a description they found on somewhere on the web. They're on a hunt for the unexpected. I'm not saying that it's pointless to capture, trade or publish notes. What I am saying is: don't assume that one experience or a single description can summarize an oyster's entire expression. Because it doesn't. It's far from it. It fluctuates week to week, month to month, year to year. Hyper vintages, if you will. I'm not saying that it's pointless to capture, trade or publish notes. What I am saying is: let's not kid ourselves and assume that one experience or a single description can summarize an oyster's entire expression. Because it doesn't. (It's far from it.) It fluctuates week to week, month to month, year to year. The oyster world revolves around hyper vintages, if you will. And that leads me to Cape May Salts. 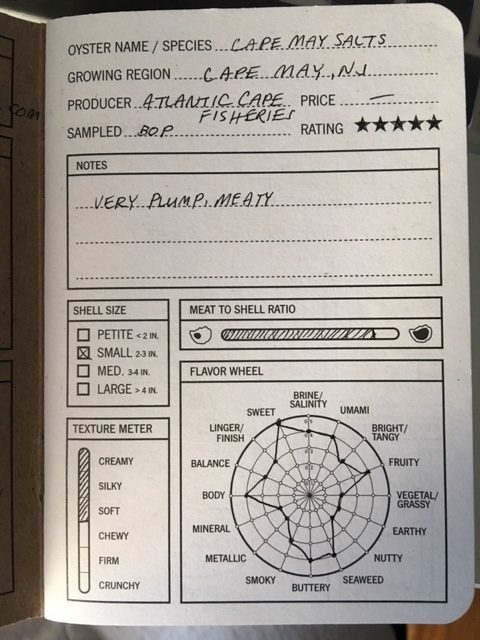 It is one of the few varieties that I have build a respectable collection of tasting notes on. They're so easy to write about because they always seem to be around (but seriously guys, NJ oysters need a lot more love). Cape May Salts have surprised me more often than any other oyster. One year, they're beautifully crisp with pointed salinity and sweet like ripe plums. The next year, they are earthy and mushroomy and mellow. Have you ever experienced that before? Whiskey Washback — October 11, 2015 Cape May Salts (naked) paired with Port Charlotte Scottish Barley. I visited the Cape May Oyster farm a few months ago and was very impressed with their oysters from this year. The plump, buttery meats are a delight to savor. While the Scottish Barley is beautiful on its own, I didn’t love the pairing in this case. The strong peatiness of this scotch overpowered the subtleties of the Cape May Salt. Had the oyster been somehow cold smoked with a liquid smoke version of this scotch, I think it would’ve done well. Or maybe if you cut the scotch with oyster liquor? The Dressler — May 9, 2012 First course was a simple and tasty Shooter featuring a plump Cape May Salt Oyster from the Cape Shore of Delaware Bay, NJ and a small glass of tomato water, bloody mary, and mezcal. The combination was potent and refreshing. The Cape May Salt was simultaneously succulent and firm. Also you can’t go wrong with starting with a little booze. Saxon & Parole — February 16, 2012 The deeper we get into the meal, the heavier the courses become. At this point, the oysters begin to take a backseat to the creation... Same with the grilled and chilled tuna with baby romaine, green beans, olives and a Cape May Caesar dressing. It was delicious but didn’t showcase the oyster as well as the earlier courses. Hank's Oyster Bar — December 5, 2009 Cape May Salt: A small petite (1 inch) oyster that tasted very clean and crisp. The meat was very light, plump, and the liquid was moderately salty. To truly appreciate why an oyster tastes the way it does, I always want to go to the source. I want to shake hands with the people who handle the oyster for three seasons or more. Last summer I had a chance to do just that. 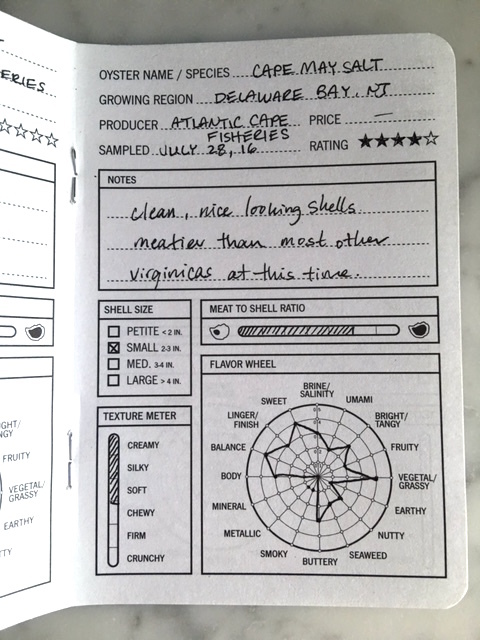 Cape May Salts are raised and marketed by Atlantic Cape Fisheries, a well-established Northeastern shellfish & seafood company that deals a lot with scallops, squid, and other tasty treats of the sea. Brian Harman, farm manager for Atlantic Cape Fisheries can usually be found either in the mud or on the phone. 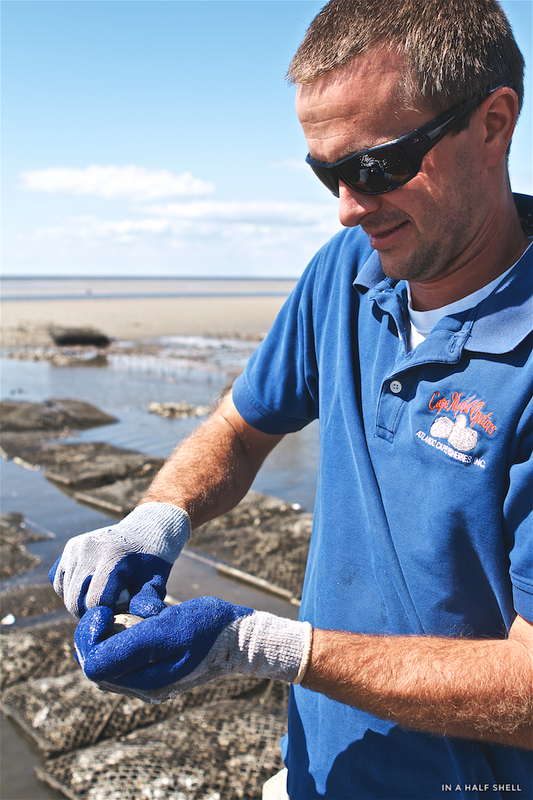 He started his career as a hatchery specialist at Rutgers University and eventually took over the production of Cape May Salts, the largest oyster farm in NJ at the moment. 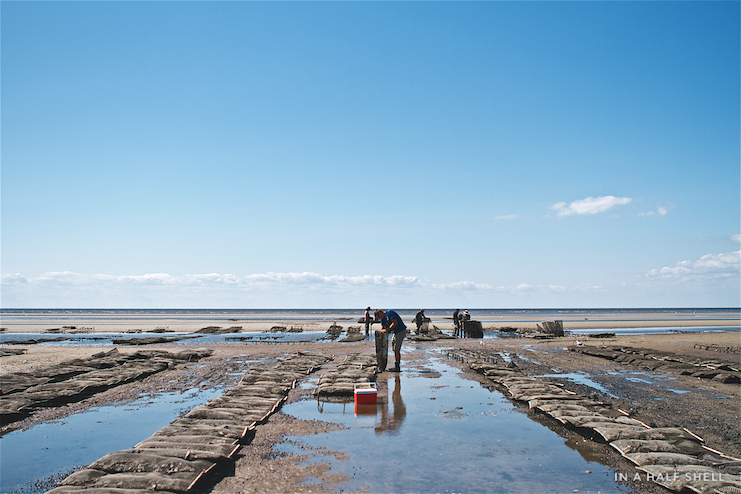 I learned that the relationship between Rutgers University and commercial oyster cultivation along the New Jersey coastline is deeply intertwined. 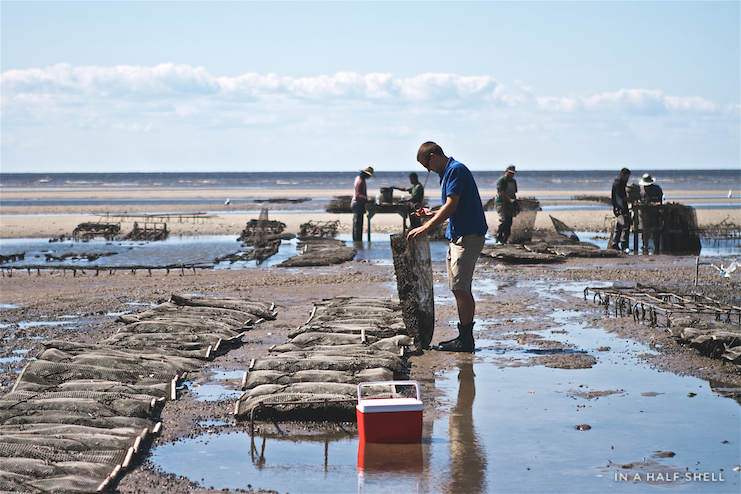 Had it not been for the ongoing shellfisheries research program at Rutgers, which first began with Julius Nelson in 1888 and eventually led to Harold Haley Haskin's oyster-saving work in the 1950's, there would not be nearly as much oyster farming along the Atlantic coast. 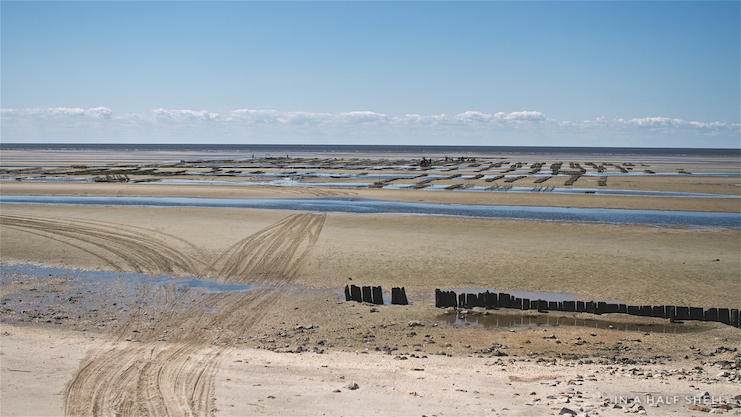 The Haskin Shellfish Research Laboratory can still be seen from the oyster farm (tucked away on the right in the image below). It serves as an apt reminder of the work that has come before and the work that still has yet to be done. Back to the farm. The low tide exposed a few hundred yards of densely packed sand. Although the tides here aren't terribly large (~5ft), the gradual incline of the beach can play a visual trick on you. The water averages around 25ppt salinity, and Brian noted that it's never lower than 23ppt. Of course, no farm tour is complete without a taste test. My favorite part, obviously. It wasn't terribly hot out that day, but to be safe Brian brought along a small cooler of ice-packed Cape May Salts that were recently harvested to try. It still amazes me that every Cape May Salt that I've had in my life came from this exact spot. Unless if you belong to a CSA, when else do you have that certainty about where your food comes from? Brian popped one open in a snap. Just look at that plumpness. Now that's what I call a premium meat-to-shell ratio. Fast forward to a couple of months ago. I received a package containing a brand new oyster that Brian has been working on at the farm. Same site, different method. Always happy to play the guinea pig for friends, I was immediately excited by the look of these. As of right now, it's a nameless product. 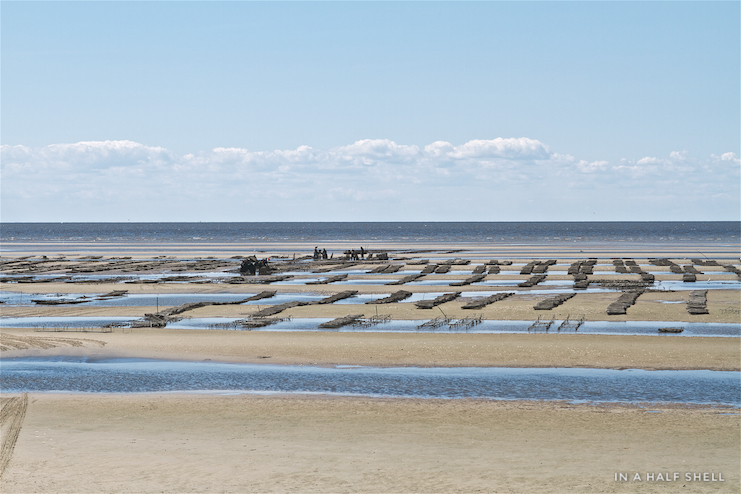 But for the oyster nerds who are reading this (and see the photos below), you probably can guess just how they're grown. 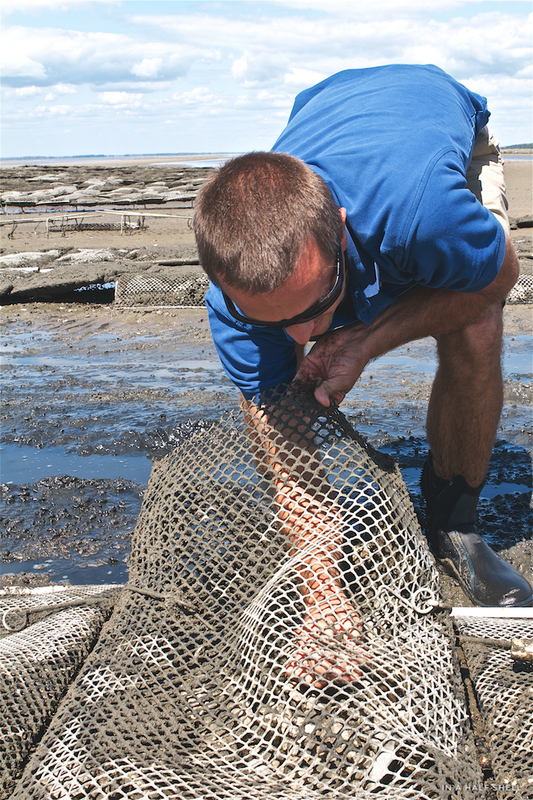 One of the newest innovations in oyster grow out technique/technology is the tide-powered "flip bag" method, which was first developed at Chelsea Farms by John Lentz and Tom Bloomfield. The idea of using the tides to literally do the heavy lifting for growers has spread pretty widely across the Pacific Northwest, but this is the first time that I've heard of an East Coast farm attempting to do it (unless if I'm having a total brain fart and can't think of any others). Anyone want to correct me here? Anyway, these little nuggets are beauties and ridiculously cute. I immediately fell in love with the petite size, walnut shape, and uber plumpness. They're super easy to shuck because the shells are thick and sturdy. There wasn't much chipping at all, which made for a great slurping experience.